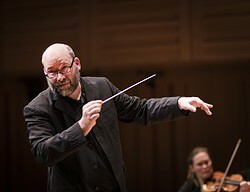 The English Symphony Orchestra, hailed as The International Orchestra of Elgar Country, will take to the St. John’s Smith Square stage on Thursday, 19 April 2018, in a programme of works by Aaron Copland, Charles Ives, Walter Piston and Jesse Jones as part of the Americana '18 series. ESO Artistic Director Kenneth Woods will conduct, and will host a pre-concert discussion with Jesse Jones and clarinet soloist Emma Johnson. The programme the ESO brings to St. John’s Smith Square’s highly praised-Americana '18 project (directed by David Wordsworth) is a perfect exemplar of Woods’ approach to American music, ranging from jazz-inspired Copland through spiritual Ives to the premiere of a new work by young American composer Jesse Jones, winner of both the Guggenheim and Rome Prizes, one of the outstanding composers of the new generation whose recent commissions include a work for the Juilliard Quartet and an opera for the Aldeburgh Festival. “Copland’s music is richer, deeper and far more interesting than most people realise and the Clarinet Concerto is fascinating for the way in which Copland manages to treat all this popular musical language with such originality and skill.” Emma Johnson, hailed by The Times as "Britain's favourite clarinettist" is the soloist. The concert concludes with the Sinfonietta by Walter Piston. “Piston’s music should be better known - he might have been the greatest member of that generation of American composers like Roy Harris and William Schuman who grappled with the idea of what an American symphony could and should be,” says Woods. “His numbered symphonies are full of drama and energy, but the Sinfonietta is like an American Haydn symphony. It’s not Neo-Classical, but it has the kind of wit and economy that makes Haydn’s music so rewarding and engaging.